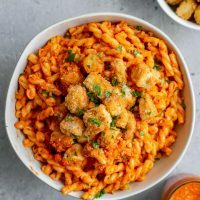 This pasta romesco with crispy baked tofu is one my favorite meals. It looks fancy and tastes amazing, but requires very little effort and time to put together. And while I love a project, these easy, healthy, flavorful meals are my bread and [vegan] butter! Er, that is to say, they get me by on busy and/or lazy days! For this dish I used my easy romesco sauce. It’s a zesty, roasted pepper sauce made creamy with ground almonds, tangy with roasted tomato, and a little zippy with charred chiles. The recipe for romesco makes quite a bit of sauce, so when I get tired of dipping french fries in it (hah, never! but ya know, variety and dinner are important) pasta comes to my rescue! And while pasta tossed in romesco makes for a delicious meal on it’s own, sometimes you need to get a little fancier and get a little extra protein and satiation. That’s where tofu comes in! When it comes to adding tofu to your pasta dishes, I get a bit particular. Pasta is chewy, but also soft, as is a good extra firm style of tofu. But I like a little textural contrast in my food and breading the tofu then baking it up until deliciously crispy does the trick. 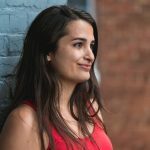 I adapted these tofu bites from my crispy baked buffalo tofu wings, which is one of my favorite recipes on the blog. Choosing an extra firm or super firm tofu, dicing it up into cubes, then doing a 2-part breading are key to making the perfect tofu bites. First, if you’re using a wetter extra firm tofu, you’ll want to press out some of the extra water out. This just helps it crisp up better. Then in a large mixing bowl sprinkle corn starch over the tofu and gently toss to coat the tofu. Next, we pour a bit of plant milk over the tofu and gently toss that to coat. Now the tofu is covered in a sticky starchy slurry, perfect for picking up the seasoned bread crumb mixture! 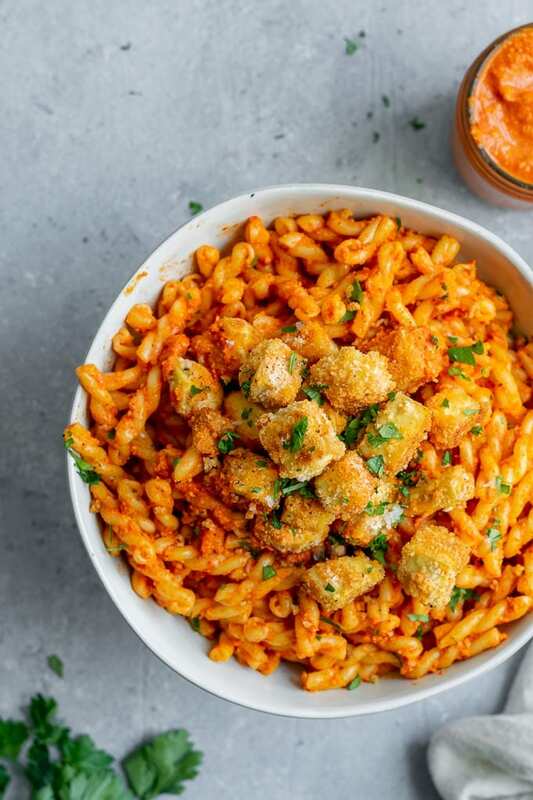 At this point you can either toss the tofu in the seasoned bread crumb mixture in the bowl, which will not coat the tofu as perfectly and lead to some breadcrumbs being left behind in the bottom of the bowl. Or you can dip each piece of tofu into the breadcrumbs individually. Which you choose really depends on 1) how lazy you’re feeling (both with effort and clean up!) and 2) if you’re serving it just for yourself or family or to guests. Either way, get those breaded tofu cubes onto a baking sheet, drizzle some oil over them and stick in a hot oven to bake! And those leftover crumbs? don’t worry, we’ll use them as well! Get them on a second baking sheet and let them toast up alongside the tofu, just keep an eye on them as they’ll take a lot less time to bake. Those seasoned, toasted breadcrumbs make for a tasty crumb topping over the creamy romesco sauce and should definitely not be skipped! 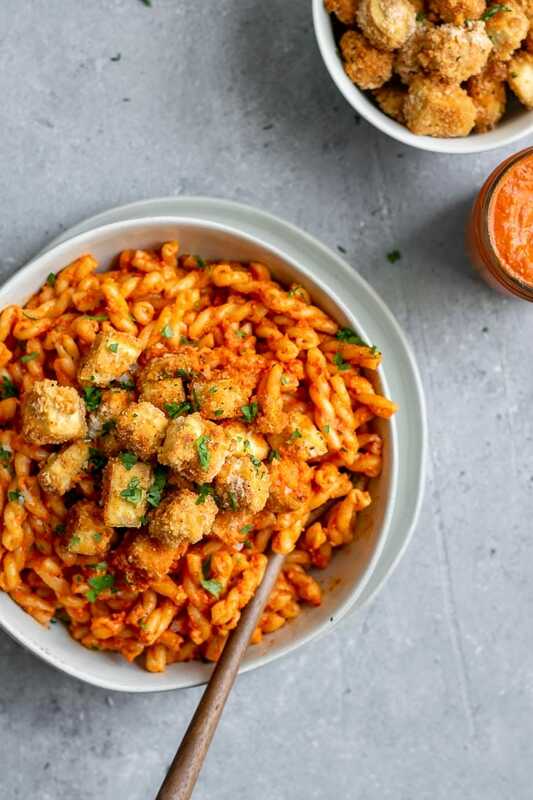 This pasta romesco with crispy baked tofu is a party for your senses. 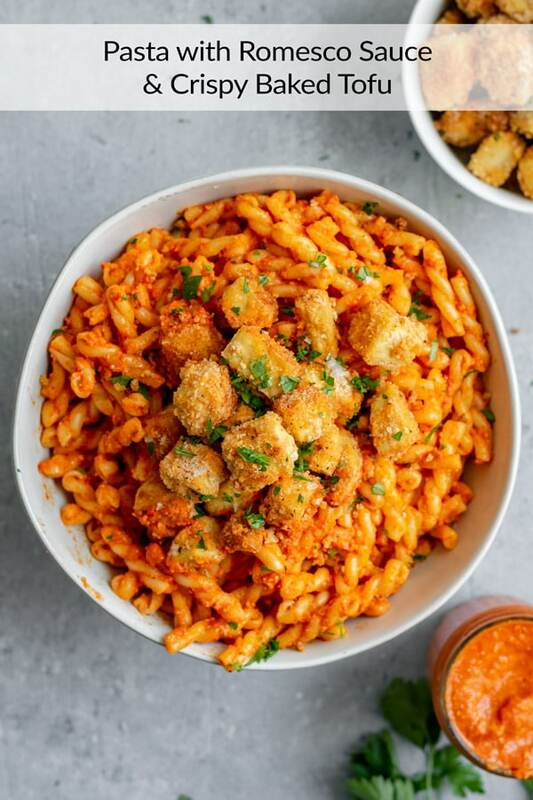 We have chewy pasta and crisp tofu nuggets. A zippy, zesty sauce and mild, almost milky tofu. Just the best! So if you’re looking for an easy and delicious weeknight meal, you can just stop here! And if you do make the recipe, go ahead and rate it and leave a review below! Don’t forget to tag your recreations @thecuriouschickpea and #thecuriouschickpea on Instagram, I absolutely love seeing your photos! Gluten free: switch out gluten free bread crumbs and a gluten free pasta. 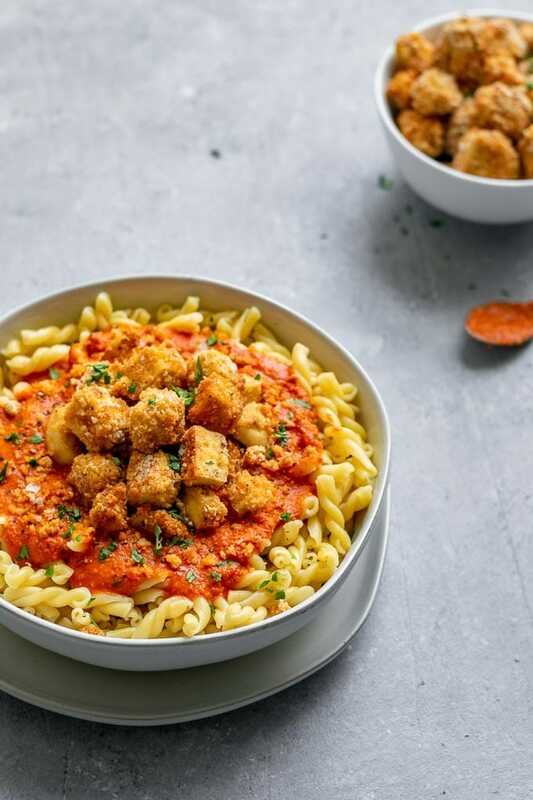 Pasta is served with a flavorful romesco sauce and topped with crispy baked breaded tofu. 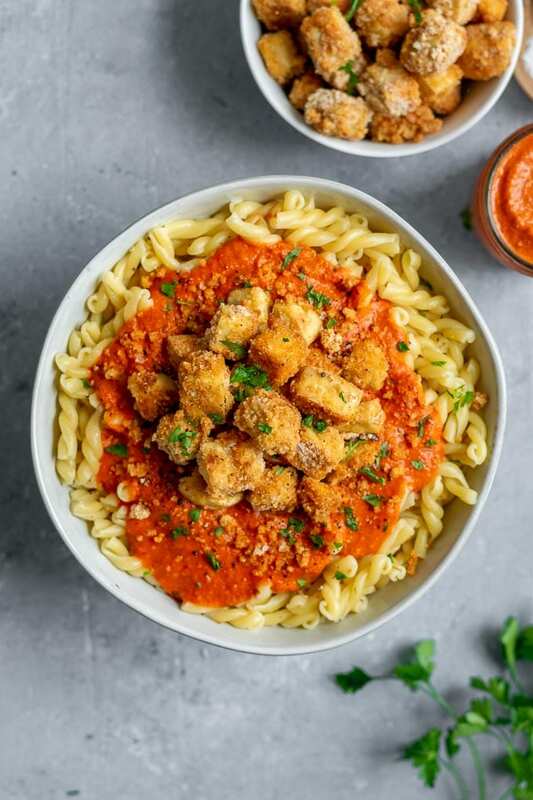 The smokey almond and roasted red pepper sauce is creamy and delicious on the pasta and mild tofu. I love to serve it with a side of veggies: roasted cauliflower, sautéed greens, or a side salad! Preheat the oven to 425 ºF. Pour 1 tbsp of olive oil into a rimmed baking sheet and spread to coat. Put the tofu cubes in a large mixing bowl and toss with 4 tbsp (1/4 cup) corn starch to fully coat the tofu. Add 1-2 tbsp more corn starch if the tofu still looks damp. Pour in the plant milk and gently stir to coat to make a sticky tofu. Mix together the bread crumbs, salt, smoked paprika, granulated garlic, and black pepper in a small bowl. Either dip each of the sticky coated tofu cubes into the bread crumbs and place on the greased baking tray, or for a sloppier coating pour the breadcrumb mixture into the mixing bowl and gently stir to get the tofu mostly coated. Transfer the tofu to a baking tray. Drizzle the remaining 1 tbsp of olive oil over the top of the tofu. Bake the tofu for 20-25 minutes flipping after 15 minutes. It's done when crispy! Toast the bread crumbs in a second baking tray for about 10 minutes until crispy and golden. While the tofu bakes, make the pasta according to package directions. Drain and return to pot to toss with romesco sauce. Serve and top with the crispy tofu and the crispy bread crumbs plus a garnish of parsley. If using extra firm tofu you can press out extra water from the tofu. Slice the tofu into slabs then wrap in a clean lint-free towel or with paper towels and set something heavy on it for about 20 minutes. Then proceed to cube the tofu then bread.